Fig. 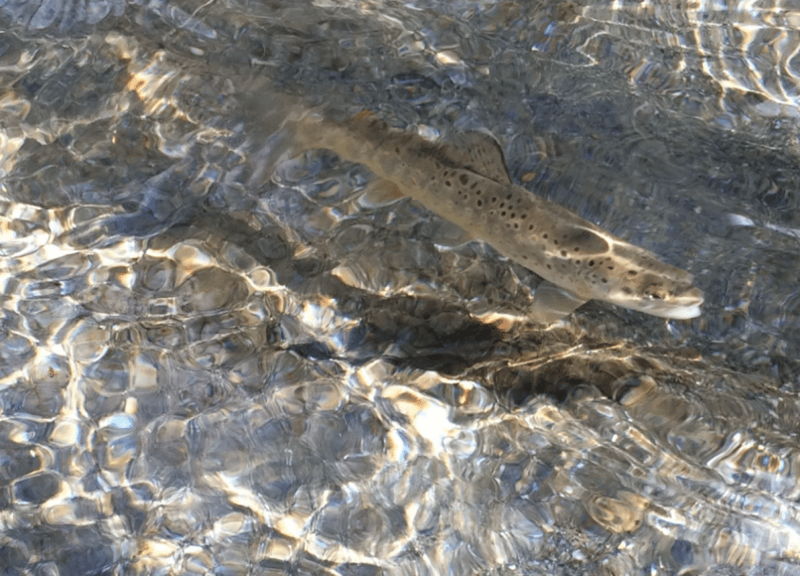 1: A cryptic brown trout (Salmo trutta) in her natural environment (photo courtesy Dr. Laetitia Wilkins). Rivers and lakes in the Alps are home to numerous aquatic invertebrates and fishes. However, many people have never seen them because these waters are cold and most of the aquatic critters hide well. A key member and top predator in the aquatic freshwater system is the brown trout (Salmo trutta). Brown trout seem to be, as the name implies, mostly brown or grey. Their cryptic body coloration helps them melt in with their environment to hide from terrestrial predators like birds of prey or bears. However, if you get the chance to look more carefully, you will realize that brown trout are not just brown but also ornamented with bright blue, orange and red patterns all over their body, including beautiful spots on their sides and fins. Moreover, females lay eggs that can vary in color from pale yellow to very bright red. These colors are due to pigment molecules, also called carotenoids, that are commonly found in paprika, carrots, autumn leaves, and crustaceans. Trout acquire carotenoids through their food, they cannot synthesize them by themselves. Then, these pigment molecules are allocated to different body parts. Trout store carotenoids mostly in their muscles throughout the year. This gives them the typical orange color you often see as meat at grocery stores. During the breeding season carotenoids are re-allocated to the fish skin and eggs. This has been exemplarily demonstrated by Garner and colleagues in Chinook salmon (Oncorhynchus tshawytscha), a related species in the same fish family. Carotenoids play numerous beneficial roles for animals. They act as antioxidants to protect tissues against free radicals, they improve the immune system and the proliferation of antibodies, they enhance vision, and they are important for the vertebrate embryo development. Additionally, these pigment molecules can also be used for intraspecific signaling. Fish can communicate through their red coloration. This happens for example during the mating season when individuals signal their quality through body ornamentation. Fig. 2: Red spots during the spawning season (photo courtesy Dr. Laetitia Wilkins). It could be shown in hatcheries that fish fed with carotenoids had a higher fertilization success. Yet, such supplementation studies also taught us that high concentrations of carotenoids can become toxic. This is why we chose to work with a natural population of brown trout and measure carotenoids that females had allocated themselves to their eggs before spawning. Instead of using arbitrary concentrations of carotenoids and adding them to fish food we measured carotenoid concentrations at ecologically-relevant conditions. We already knew from an earlier study that naturally acquired carotenoids are important for the embryos during the stress of environmental pollution. This earlier study also revealed which types of carotenoids mattered. In this study here, we targeted these important carotenoids (astaxanthin, capsanthin, lutein, and zeaxanthin) and tested whether their content in eggs helps trout embryos during the infection with a pathogen. Because fish can re-allocate carotenoids among different tissues, we also measured and compared the redness of the mother’s skin (as a measure of carotenoids stored in the skin) to the allocation of carotenoids into clutches to infer maternal strategies. Fig. 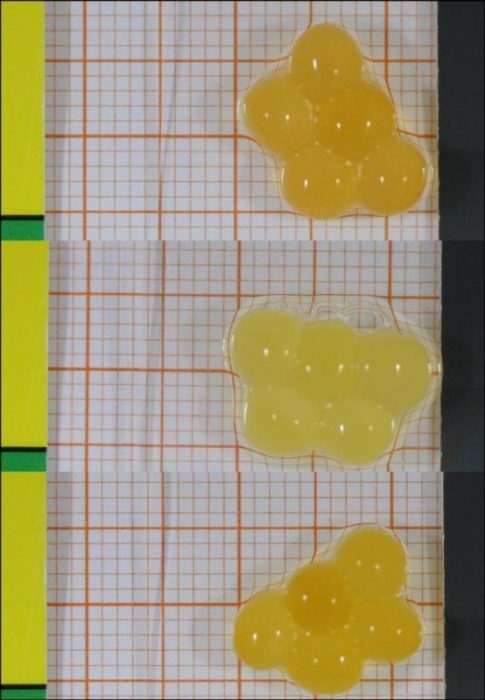 3: Variation in brown trout egg coloration (photo courtesy Dr. Laetitia Wilkins). For our experiment, we went out into the field and caught wild brown trout during the breeding season at their spawning sites. We brought all the fish to a hatchery, measured them, took photos inside a box with artificial light, and collected their gametes (eggs and sperm). These gametes were then used for in vitro fertilizations. Brown trout have an external fertilization system, hence, eggs and sperm can be mixed and fertilized in the laboratory. We produced 185 families. The parents were released into the wild after the experiment. 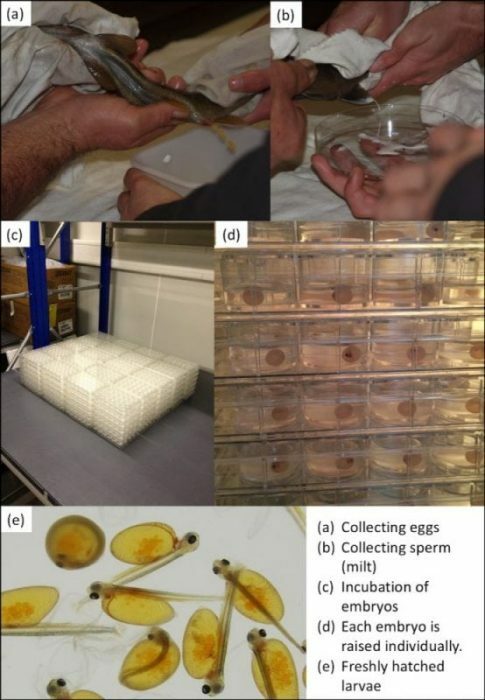 The resulting 2,960 embryos (16 replicates per family) were raised individually in little containers and either sham-treated with water or incubated with the opportunistic bacterial fish pathogen Pseudomonas fluorescens (8 embryo replicates per treatment and family). This bug had been isolated in the past from naturally spawned brown trout eggs and kept as a stock in our laboratory. Previous studies in the Wedekind lab showed that it develops virulent characteristics towards the fish embryo. Our experimental set-up is very powerful because it allows us to measure the effects of the father, the mother, the treatment (here with P. fluorescens), and the compounds in the eggs on embryo responses or traits. We monitored all embryos until 10 days after hatching and recorded their individual survival, time until hatching, size at hatching and growth after hatching. These crucial fitness traits were then linked to initial concentrations of carotenoids in the eggs before spawning, and the treatment group was contrasted with the control. Our collaborators at the École Polytechnique Fédérale de Lausanne, Switzerland used quantitative liquid chromatography-high-resolution mass spectrometry to measure the amounts of carotenoids in brown trout eggs. Fig. 4: Experimental set-up (photo courtesy David Nusbaumer & Dr. Laetitia Wilkins). The infections with P. fluorescens decreased embryo survival, increased time until hatching, and resulted in smaller hatchlings. We learned that the carotenoid compound astaxanthin largely determined redness of the eggs. Neither egg weight nor female size was correlated with astaxanthin concentrations in the eggs. However, this carotenoid was positively correlated with growth after hatching and it improved tolerance against the fish pathogen. It can be concluded that astaxanthin concentrations in unfertilized eggs at ecologically-relevant concentrations were beneficial for the embryos during a pathogen infection. Astaxanthin mitigated the negative effects of the pathogen, it worked like a shield to protect the embryos. We do not know the mechanisms in detail but we have two main explanations: (i) When embryos hatch they are suddenly exposed to much higher concentrations of oxygen which can cause peroxidation of their tissues. With the onset of respiration after hatching, larvae show an increased metabolism with an associated risk of oxidative stress. Astaxanthin might work as an antioxidant for the embryos during this sensitive phase. (ii) Astaxanthin can boost the immune response to pathogen stress. It supports the proliferation of immune cells and antibodies. Astaxanthin might help the embryos mount an early immune response against P. fluorescens (both explanations are discussed in more detail here. Nevertheless, although astaxanthin helped the embryos under pathogen stress we also saw that not all females seemed to maximize the amounts of carotenoids they allocated to their eggs. The number of carotenoids that females allocated to their eggs were negatively correlated with the redness of their skin. We believe that females are making a trade-off between their own needs of carotenoids and the support of their offspring. Brown trout are iteroparous, that means they can spawn several times during their lifetime. Younger females might invest less carotenoids into their eggs because they need them for their own survival. This is all reported in the journal Oecologia. We are now looking into the mechanisms of carotenoid consumption during embryo development. The next time you go camping, fishing or diving near a cold river, keep an eye out for the garment of fish species you might see. If it is red, it is most probably caused by carotenoids and meant for some purpose. 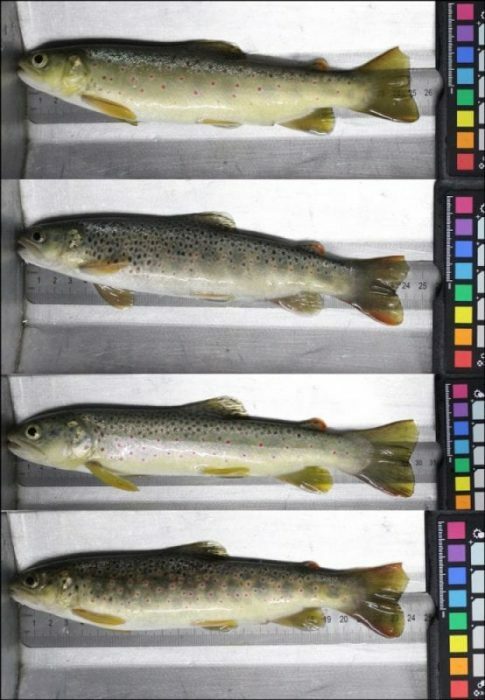 The study, Maternal allocation of carotenoids increases tolerance to bacterial infection in brown trout was recently published in the journal Oecologia. 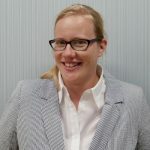 Laetitia Wilkins is a PhD student and evolutionary biology researcher at the University of Davis, California.